Conservatives need to get their act together and not blow another opportunity to push back liberalism. 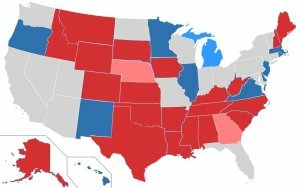 In both of the last two elections in 2012 and 2010, a Senate majority was in reach but Republican candidates ran self-defeating campaigns, and the red-state base didn’t show up on Election Day. The no-show mistake cannot be repeated again because the future of the country is on the line, and the dangerous Obama agenda must be repudiated. Debt: U.S. National Debt is at $17.9 trillion. Put another way, that is more than seventeen-thousand million. We are in such a big hole that the numbers don’t even make sense, and a ton of that debt is owned by the Chinese Communist Party in Beijing. Out-of-control government spending endangers our liberty when Washington is dependent on our enemies to stay afloat. Obamacare: Fewer Americans are covered than before Obama’s “signature legislative achievement” was rammed through a lame-duck session of Congress. Health costs are escalating rapidly, insurance is dropping people, and if you like your doctor – you can’t keep him. Unless Obamacare is overturned, say hello to death panels and a high-speed toll lane to national bankruptcy. Beheadings: Jihad is on the march at every point on the compass, but the White House is committed to the absurd notion that Islam is a religion of peace. While Americans are beheaded by ISIS, President Obama is fist-pumping his golfing buddies on the fairway. Don’t forget that Barack can chime the Muslim call to prayer “in perfect Arabic,” as the New York Times reported. It is time for a new, conservative Senate to put some heat on a commander-in-chief who makes Neville Chamberlain look like Mike Tyson. Retreat: Our allies don’t trust us, and our enemies don’t fear us. The Iranian mullahs are on the cusp of obtaining nuclear weapons while Israel is hung out to dry by what’s supposed to be the leader of the free world. The whole planet is coming apart at the seams without U.S. power and vision to keep it together. It’s a huge gamble whether the world can stumble through two more years of Obama “leading from behind” without a blowup of historic consequence. Border Chaos: Whether it’s the spread of a pandemic disease like Ebola, terrorist strikes on our home soil from within, gang violence, growing unemployment and falling wages for American citizens, or a host of other ills, U.S. security is compromised by an open, unprotected border with Mexico. The United States needs a president who will put Americans first. Electing a Senate that will do so is a necessary first step toward making real change in the 2016 presidential contest. The future hangs in the balance for the greatest nation the world has ever seen. Conservatives have themselves to blame for the last two years of damage Obama has caused because voter turnout was lower in the last cycle than when this most radical president was first elected in 2008. Does the national will exist to fight back against anti-American leftist ideology and roll back Big Government? The 2014 midterm election is a must-win battle in the war to save America. GOP Caving on Loretta Lynch AG Nomination?